Are you working and living in Sydney and in need of NAATI Certified Sydney translation services? Look no further; our experienced translators are NAATI certified so you’ll be sure that your translations conform to Australia’s high standards. Get a free quote today for NAATI certified translation! Whether you are looking for Sydney translation services for your visa application, immigration, academic purposes, business, or job applications, OPAL Translation is here to help. Every year we have translated hundreds of documents and have 100% acceptance rate in authorities requiring NAATI certified translations. If you are looking for Sydney translation services, you’ve come to the right place! Here are reasons why you should choose us. Do you have any questions? Need help with your translations? We are available 24/7 to answer your enquiries. Our customer service representatives are dedicated to providing you the best service. We provide free quotes for your documents. Simply complete the translation quote form on this page. In less than 15 minutes, you will receive a free quote via email. Pretty awesome, right? Once you are satisfied with the price, you can proceed to inform us if you want to go ahead with the translation. Not only do we strive to provide accurate translations, but we also aim to offer fast services. With the help of our highly skilled and experienced NAATI certified translators, you can count on us to complete your translations before your deadline. So what are you waiting for? Talk to us via the Live Chat below and let’s get your translation started! Affordable and high-quality translation services? You can only find that here at OPAL Translation! All thanks to our low-cost business model, we’ve made it possible to provide our clients with budget-friendly rates. Whether you are on a tight budget or looking for an affordable translation services provider in Sydney, we’ve got you covered! We work closely with our clients from the concept stage until delivering the final translation. At OPAL Translation, we make sure that you receive quality Sydney translation services by providing you with experienced Sydney NAATI Translators who have proven time and again that they are capable of producing high quality, accurate and error-free translations. Whether your need is small or large, we will assist you with your Sydney translation requests. Contact our 24/7 customer service representatives via chat and inquire about our Sydney translation services. Get a quote. Fill the enquiry form located on this page today and receive a firm quote within 15 minutes via email absolutely free! What types of documents can you translate? Be it a birth certificate, marriage certificate, academic transcript, divorce decrees, driver’s license or any personal document that you need to be translated; our Sydney translation services can accommodate your needs. We also translate financial reports, marketing materials, technical documents, legal documents, engineering manuals and other document types for your business and organisation. Send us a scan or photo of your document via our enquiry form and we will get in touch within 15 minutes. What language do you provide Sydney translation services in? For 5 years, OPAL Translation has translated all sorts of documents to all languages. As such, we are the leading Sydney translation services provider. Let us know your translation needs, and we will be happy to assist you. If you don’t see your preferred language on the list, just give us a chat and we’ll provide you with one of our best and most qualified translator to handle your documents. Depending on the document’s length, language and complexity, our Sydney NAATI translators can finish a translation in 2-3 days. If you are in a hurry, we accommodate urgent cases. Contact us via our enquiry form or our 24/7 customer support. We’ll be happy to provide you with our services. 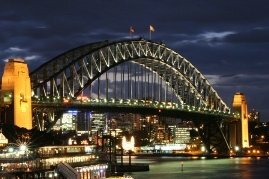 Here are some facts and trivia about Australia’s most iconic city, Sydney, that you may not know. The term used to call people who live in Sydney are Sydneysiders. It took nine years to build the Sydney Harbour Bridge and another 56 years to pay off the debt that was used to build it. The postcode of Sydney is 2000. Ironically, it is the same number of the year when it hosted the Olympics. A world record for the largest swimsuit photo ever in 2007 featured 1,010 women in bikinis at the Bondi beach in Sydney. Sydney was never officially used as a name from 1784 to 1789 because the first settlers were too busy setting up in their new country. The first occupants of Sydney were the Australian Aborigines where they lived for at least 30,000 years. For as low as $69 per page, you can get your document translated with the most affordable Sydney translation services. Standard documents such as personal documents are priced at a per page rate. On the other hand, non-standard documents are priced at a per 100 word rate. Get an exact quote by completing our enquiry form located on this page. Attach a scan of your document and we will email you a detailed estimate within 15 minutes! Get a free quote in under 15 minutes today!